After a sexual assault scandal, American Atheists could have hired Mandisa Thomas, of the national Black Non-Believers organization, but instead chose yet another white man. 2012 Global Atheist Convention - Richard Dawkins and Daniel Dennett. The #MeToo movement has had a titanic effect on public awareness and accountability around sexual harassment and sexual violence. In some sectors, predator executives, talking heads, and actors have been toppled and exiled from public life. Some victims have had a mainstream platform to demand reckoning and accountability, while social media has crackled with high-profile rebuke. Despite these inroads, what has not happened is any meaningful shift in power, authority, and decision making in executive management from the usual white cis straight male regime. 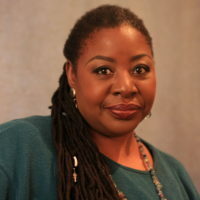 Indeed, the mainstream iteration of #MeToo conflicts with the original intentions of its black feminist founder Tarana Burke, who sought to empower marginalized black women survivors. So, while #MeToo has been most successful in bringing white victims and survivors to the fore, its greatest test will be whether this visibility leads to a change in management culture and its racist/sexist/heterosexist hierarchies. Thomas, along with three other black women atheists and myself, was recently featured in The Humanist magazine’s July-August cover story “Five Fierce Humanists.” The cover was the first of its kind from an atheist or humanist publication. Our commentaries highlighted the lack of visibility of people of color in movement atheism and the racist power vacuum in atheist/skeptic/secular humanist leadership hierarchies. Movement atheism has long been hostile to the efforts of black, Latinx and Asian non-believers to address anti-racism, feminism, social justice, queer intersectionality, and the lived experiences of segregated folks of color. But this overt hostility is also buttressed by a “more benign” white leadership that spouts inclusivity yet remains white and middle class. This climate has contributed to an exodus of people of color, white women, and queer folks outraged by harassment and microaggressions in atheist/humanist/skeptic circles. In 2014, Amy Davis Roth of Skepchick spearheaded an exhibit featuring atheist women who’d been targets of online and real time stalking and harassment. During this period, some organizations implemented anti-sexual harassment and professional conduct policies for secular events. These policies were band-aids over the real issue of power, control, and authority in movement atheism, which is still in the thrall of global figureheads such as Richard Dawkins and Sam Harris, while propping up disgraced skeptic gurus like Lawrence Krauss and Michael Shermer, who have both been accused of sexual misconduct. Most non-believers of color remain “closeted” because of anti-atheist vitriol in communities of color and the white mainstream. And they are disengaged from the lily-white, privileged world of atheist, secular humanist politics. Yet, as the population of so-called religious “Nones” of color grows, secular organizations like AA, the American Humanist Association, Foundation Beyond Belief, the Freedom From Religion Foundation, the Center for Inquiry and the Secular Student Alliance will remain complicit in the power disparities that mobilized #MeToo if cis white men and women continue to dominate their management and boards.